In response to the ongoing drought which has hit several parts of Kenya for the last one-year, the European Union is providing an additional €23 million to contain the worst impacts of drought among the most affected communities. In addition to meeting the most urgent needs of the most affected people, the initiative will also contribute to strengthening the capacity of counties and local communities to respond to and prepare for disasters aiming to prevent future loss of assets. The additional funding will be managed by the National Drought Management Authority (NDMA) over the next three years. Depressed rainfall around the country has undermined the resilience of many communities particularly in drought prone Arid and Semi-Arid Lands (ASALs) and negatively impacted livelihoods. “When we look at the impact of drought and climate change, we need to look at the capacity of counties and communities to better respond to disasters, to cope with the crisis in a timely manner, and to invest in strategies that will help them recover,” said EU Ambassador to Kenya, Stefano Dejak. He was speaking in Lodwar, Turkana County where he announced the new supports. The additional funding is part of the EU’s overall contribution to complement government efforts to strengthen and institutionalise drought management. 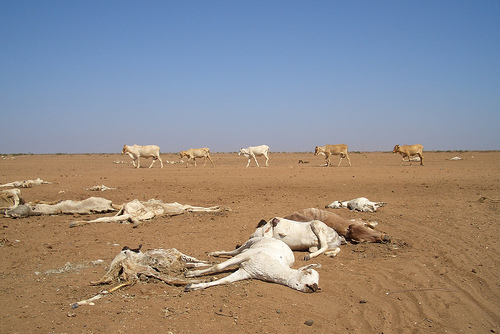 The government of Kenya has flagged drought as one of the biggest threats to the well-being of people in the arid and semi-arid lands (ASALs) and to the achievement of Vision 2030. The EU has already provided €66.4 million towards the Kenya Rural Development Programme (KRDP) out of a sector total of EUR 168.85 million aimed at securing long-term food security in Kenya and promotion of resilience to climate shocks. Through KRDP, the EU is supporting the NDMA to effectively prepare and respond to drought and floods using a €10 million Drought Contingency Fund (DCF). The supports to drought mitigation and preparedness will be soon complemented by a €20 million programme aiming to improve water supply and sanitation in ASALs, which has been signed by the EU Commissioner for development during his visit to Kenya in December 2016.